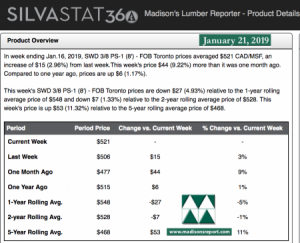 Canadian and US construction framing dimension softwood lumber prices generally stayed firm last week, while panel prices corrected upward by a noticeable margin. In dimension lumber, benchmark commodity Western Spruce-Pine-Fir KD 2×4 #2&Btr reversed huge drops into the end of 2018 to close last week at US$338 mfbm, a $10 or 3% pop from the week before. The lumber futures contract on the Chicago Mercantile Exchange confirms this price level: on the Jan 15 contract, futures closed up-limit ($15) at US$340 while March was also up-limit to close at US$353. Trading for the May contract was at US$359. Markets in the US were closed Monday, however Friday’s finish remained at these levels. At writing Tuesday morning, lumber futures were up $7 or $8 (so closer to US$360 on the March contract). As for panel, those prices have jumped by a healthy amount. Canadian Softwood Plywood CCX 9.5mm into Toronto had the biggest jump, by $25 or 4.3%, to C$580 msf. For it’s part, benchmark panel commodity Oriented Strand Board 7/16” Ontario crested up $5 or 1.7% to end last week at C$290 msf. Terrible winter storms descended on much of eastern North America on the weekend, suggesting that accessing timber supply areas could become difficult. As well, already this week operators are reporting a difficult time with transportation and logistics as the railways are largely hampered by this bitter winter weather. Below is a graph of the highest volume, or benchmark, North American panel prices from January 2007 to January 2019. Comparison of Oriented Strand Board 7/16” Ontario vs Canadian Softwood Plywood 9.5mm Toronto. For their part, softwood lumber customers are requesting quotes on fill-in loads only. 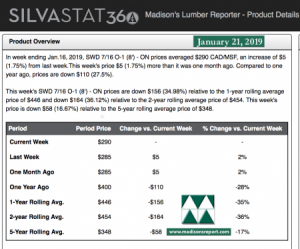 Sawmills and secondary suppliers are offering price lists which are quite attractive, but unless a buyer really needs wood for an ongoing project, most are eschewing anything but just-in-time buying for now. Inventories at both suppliers and customers remain relatively plump so no one is rushing to make big orders now. Manufacturers continue to adjust production, with West Fraser Timber announcing just last week further curtailments in British Columbia, this time at Chasm, 100 Mile House, and Chetwynd, BC, while the company’s Williams Lake operation will be in a one-week curtailment for maintenance.